Turn your attention to one popular sushi garnish with Groupon’s look at pickled ginger. While it may look lovely and add even an appealing zip when draped over your sushi, pickled ginger isn’t served as an accessory for your maki or sashimi. Instead, it’s a palate cleanser. 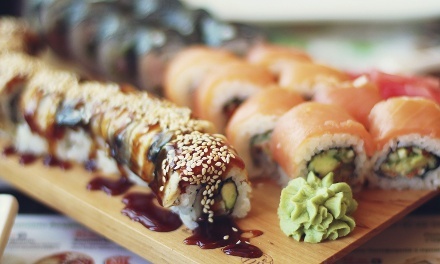 Want to go from a bite of fatty salmon to eel? Just like tasting a sorbet between courses in a French meal or dining out with your relay-race team, popping a slice of pickled ginger provides a break to refresh the tongue for the next round. Called gari in Japanese, pickled ginger is often yellow—a familiar shade to anyone who’s sliced open a fresh ginger root—or, frequently, pink. Both shades can be naturally occurring: as young ginger sits in its pickling juices it may turn pink over time, but you also can add beet juice or other vegetable dyes to strengthen the flower-petal hue. Although the flavor can be intense, the recipe requires only a few ingredients and enough fortitude to pour boiling liquid over a helpless root vegetable. In most cases, water, vinegar, sweetener, and sometimes salt are simply left to mingle their flavors with the thin-sliced ginger at least overnight and up to a month. May be repurchased every 30 days. Limit 1 per person. Limit 1 per visit. Limit 1 per table. Valid only for option purchased. Must purchase a food item. Must use promotional value of each voucher in 1 visit.